1. We may not have “leaving work” as a goal. The concept of work has changed over the years. We moved from an industrial age to an information stage, to an Internet age. In the process, our work became more self-fulfilling. In a changing economy, we learned to move from job to job, but we owned our abilities and skills. We monitored and monetized our ability to be “employable.” As a result, our identity is wrapped up in our perception of how our skills are valued by others. We do not think of exchanging time for money, but seek compensation for our knowledge and experience. As long as our skills are current, there is no reason why we should not be able to exchange them in the workforce. In addition, the nature of work has changed. We are not necessarily tied to a location, as we can work remotely with our technology. It is possible today to make a living without ever leaving home or getting out of ones pajamas. 2. Our lifetimes have expanded to give us more active years. The expected lifespan increases slightly every year, and more and more, we see people reaching 80, 90 and 100+ years with active, meaningful lives. This phenomena is also made possible by healthcare improvements. Modern science can clear out blocked arteries, replace knees with titanium joints, keep our chemical balance up with drugs and, with one body scan, identify ways to proactively conquer what might have been a deadly outcome. We are also taking a more active role in insuring our health. Diets have changed as people become more aware that eating vegetables means more than lettuce on a hamburger. Exercise programs are common routines in peoples’ lives, and programs cater to different exercise needs. 3. We are not as able to depend on pensions, 401ks and other retirement vehicles to fund our extended lifetimes. Many baby boomers were hit by the Second Great Depression at the beginning of the century. At a time when our earning and saving potential should have been the greatest, we were borrowing from savings to put our children through college and short-selling homes when income stopped and mortgage balances exceeded the value of our homes. Social Security, which we believed would be a source of income in our old age, is in jeopardy. When Social Security was established, younger generations funded older generations. This worked when the number of people in the younger generation, putting money into the system, exceeded those who were drawing from it. In fact, we enjoyed a reserve—that reserve will disappear. The Bubble of older Americans, who paid into the system for a lifetime, will soon deplete the reserve. There will simply be more people drawing from the system than adding to it. At present, the solution has not been agreed upon. Those retiring who think that the money will be there as promised, may be surprised when the payouts are reduced. By working longer on a full or part time basis, we can continue building our savings and supporting our lifestyles without adding the stress of the money question. Baby boomers have redefined every stage of life we have progressed through. Retirement is no different. 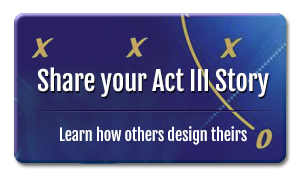 We have renamed this stage of our life “Act 3” so that individuals can write their own script so that they can choose how to define this stage of life, without being hampered by the definitions handed down to them from earlier generations. We will not go softly into the night. We will demand our human right be stay relevant, involved, current, and demand that society recognize our redefined role in society.